Two views of Kensington Gardens: one with Kensington Palace in the background. Move your cursor over the image to see the second one. Our hotel, the Grand Royale Hyde Park, across the street from Kensington Gardens. Whilst she was Edward VII's mistress, the actress, Lillie Langtry frequently performed at the in-house theatre of this hotel on 1-9 Inverness Terrace, in Bayswater. The in-house theatre is known as 'Lillie's theatre'. Move your cursor over the image to see night-time view. The hotel lobby. Move the cursor over the image to see the front lounge, with the large portrait of Queen Victoria and a smaller one of Edward VII above the doorway. The second floor staircase at the Grand Royale Hyde Park. Two views of the London Eye. Move your cursor over the image to see the second one. 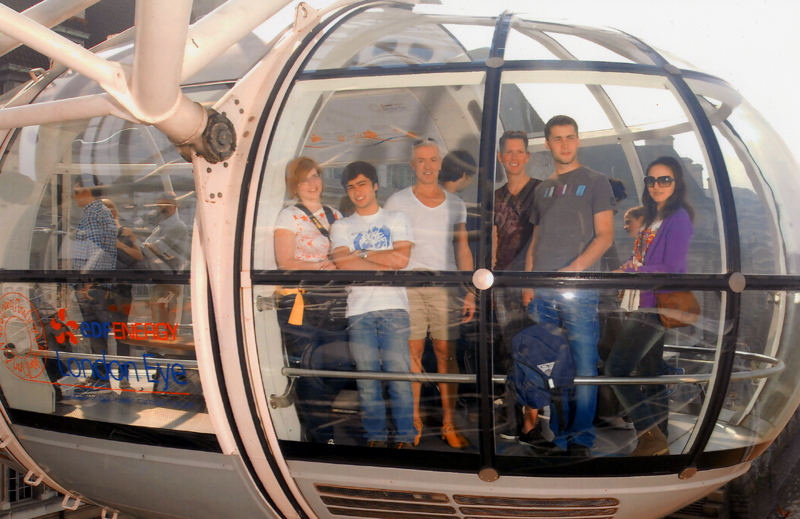 Here we are on the London Eye. Move the cursor over the image for the shot of Ian. View from the top. Move the cursor over the image for a shot of the inside of the pod. Here we are just before disembarking. Getting our feet wet, and very cold, at the Diana, Princess of Wales Memorial Fountain. Move your cursor over the image for a different shot. Strange looking birds in the Serpentine. Wellington Arch, also known as Constitution Arch or (originally) the Green Park Arch, is a triumphal arch located to the south of Hyde Park in central London and at the north western corner of Green Park (although it is now isolated on a traffic island). The arch, and Marble Arch to the north of Hyde Park, were both planned in 1825 by George IV to commemorate Britain's victories in the Napoleonic Wars. The Wellington Arch was also conceived as an outer gateway to Constitution Hill and therefore a grand entrance into central London from the west. The presence of a turnpike gate at this point had led, in the 18th century, to a strong perception that this was the beginning of London (reflected in the nickname for Apsley House as "No 1, London") and the arch was intended to reflect the importance of the position.. Move your cursor over the image for a close up. Two views of Westminster. Move the cursor over the image for the second photo. The Canada Memorial in Green Park across from Buckingham Palace. Move the cursor over the image to see an photo of the fountain. 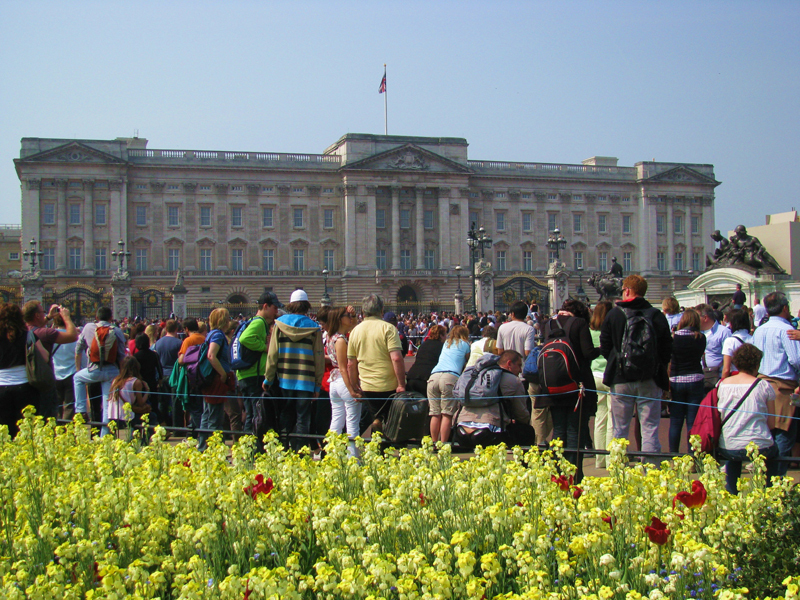 A week before the wedding and the crowds had already gathered in front of Buckingham Palace. Covent Garden Market. Move the cursor over the image for a shot of Allan. The Irish State Coach. Move your cursor over the image for a close up. The Queen's 1977 Rolls Royce Phantom VI, the car that took Kate Middleton to Westminster Abbey for her wedding. Move your cursor over the image for a shot of the rear of the vehicle. Two close ups of the Australian State Coach. Move your cursor over the image to see the second shot. Two views of the Gold State Coach. It was built in the London in 1762 and has been used at the coronation of every monarch since George IV. The coach's great age, weight, and lack of maneuverability have limited its use to grand state occasions such as coronations, royal weddings, and the jubilee of a monarch. Move your cursor over the image for a different view. 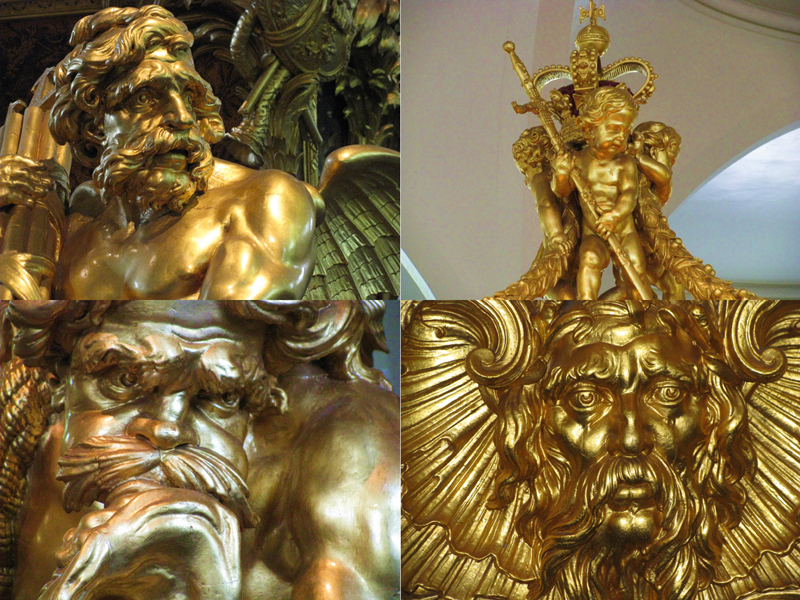 Some close up shots of detail on the Gold State Coach. Two views of the Tower of London. Move the cursor over the image for a different shot. Ian in front of the Tower Bridge. Move your cursor over the image for a close up of the bridge. Allan on Tower Bridge. Move your cursor over the image for a different shot.